Jack Welch was the CEO of GE for almost 20 years between 1981 to 2001. During his tenure, GE’s value rose by almost 4000% and he was named as the “Manager of the Century” by Fortune in 1999. Jack was known to be a tough decision maker and led to streamlining of GE’s business, even if it meant closing down factories and laying off employees. This book is a good lesson in leadership and management. It highlights the tough decisions leaders need to make in a cut-throat and competitive environment and how to break through the bureaucracy of a large organization to form a “boundaryless” culture. The book is quite engaging and well-written. However, Mr. Welch has not touched upon controversial topics and we get to know the man only through his handling of the organization. One can hardly know the man beyond his professional life and the controversial bits about his life is not touched upon at all. However this book is still considered one of the best books on management and leadership and rightly so. Gaurav Marya is hailed as the Father of Indian Franchising. He started Indian Franchising Holdings Ltd. which is responsible for the Franchise India magazine and a successful franchise consulting business as well. The business has grown exponentially across Asia and has established several successful exhibitions and trade fairs for entrepreneurs. In this book, Mr. Marya lists down ten mindset strategies for entrepreneurs. It is more of a practice guide than to be read and left aside. The book does not list down anything extraordinary, but its strength is its simplicity. It is easy to understand and under 200 pages, the book is useful. 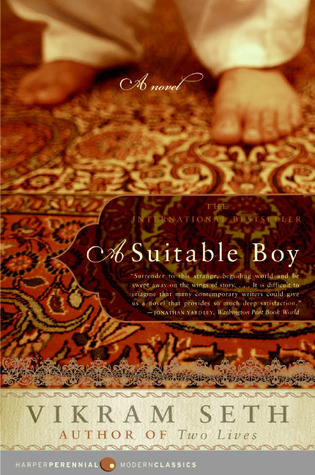 A Suitable Boy is almost 1500 pages long! In fact, I will go ahead and call it a TV show of an Indian GEC. It seems to go on forever, is seeped in traditional values and involves a plethora of characters. The book is set in 1950 in UP and Bengal and involves four families. At the heart of it though, is the story of Lata who is now of a “marriageable age” and her mother, Mrs. Rupa Mehra’s worry about finding a suitable boy for her daughter. We explore other families and characters with this backdrop and the book is a beautiful journey as we look at the India of the 50s and people of all the classes. This book is largely about relationships as one after the other, the “potential guys” reveal themselves in the plot. The relationships between friends, siblings, families, lovers, couples are opened up and left bare open in this tale. After A Fine Balance by Rohinton Mistry, this is finally a book I have read that took me in an entirely different plane. The only thing is that it is a bit too long and at some points some things become unnecessary. This book requires some patience but it is one of the best fiction I have read in a while. I will definitely read more of Vikram Seth.